In this work the significance of transesterification and curing on the thermal behavior of agro waste coir fibers has been reported. Thermal behaviour of six varieties of fibers i.e. (1) base coir, (2) coir fibers treated with 4% sodium hydroxide [Coir-ONa (4%)], (3) coir transesterfied with n-Butyl acrylate (BA) in presence of Pyridine and Acetone [Coir-BA (Py/ Acetone)], (4) benzoyl peroxide (BPO) cured [Coir-BA (Py/Acetone)] which is [Coir-BA (Py/Acetone)-C-BPO], (5) Coir-ONa (4%) transesterified with butylacrylate [Coir-BA (4% NaOH)] and (6) cured [Coir-BA (4% NaOH)] which is [Coir-BA (4% NaOH)-C-BPO] were studied from their TG, DTG, DTA and DSC. The activation energy involved in the pyrolysis of coirs and the order of reaction has been evaluated with the help of Freeman-Caroll model. It was found that the temperature of completion for degradation (Tf (°C)) of the modified coir was higher than the Base coir. Thermal stability of chemically modified fibers follow the order as Coir-BA (Py/Acetone)-C-BPO>Coir-BA (Py/Acetone)>Coir-BA (4% NaOH)-C-BPO>Coir-BA (4% NaOH)>Coir-ONa (4%)>Base coir. It was observed that transesterification and curing improve the thermal stability of the fibers, making them highly suitable for their applications as good reinforcement materials for designing and fabrication of novel polymeric composites, textile fibers, adsorbents, and adsorbates. Lignocellulosic fibers, also called “Vegetable” fibers, “Plant” fibers or “natural” fibers. They are materials rich in lignin, hemicellulose, cellulose, pectin and some water soluble materials. The great interest of these materials is directly related to their physical, chemical and mechanical properties such as low density, flexibility, biodegradability, porosity, non abrasivity, viscoelasticity, renewable natural resource of low cost and result in less wear on equipment during their processing when compared with synthetic fibers [1,2]. Due to these excellent properties, natural fibers have been used in the textile, paper, bio composites, and technological applications . Coir is a naturally occurring fiber and is available plently in the costal belt of India. Coir is a multi-component fiber whose chemical constituents are cellulose (36-43%), lignin (41-45%), hemicellulose (0.15-0.25%) and pectin together with some water soluble material . The coir fibers are also extensively used in textiles (carpets, mats), in buildings (thermal insulation) and in automobiles (seat covers, cushions) . Coir fibers have great potential for distinct applications owing to their varied physico–chemical properties [6-8]. Among the various applications suggested, use in agricultural substrate , solid state fermentation , source of tannin for industrial applications , reinforcement for polymeric composites , as a support for amylase  and lipase immobilization [13,14]. For a number of these applications, the characteristics of the fiber surface are very important to obtain a high quality product. Chemical treatments of fibers have been reported to improve their wettability and to modify their microstructure, surface topography, surface chemical groups and tensile strength [4,5,15-21]. These changes may have positive influence on the interaction between matrix and polymer (in case of composites), adsorbent and adsorbate (for use as adsorbent of metals and pigments), enzyme and support and/or functionalizing agent and support (for immobilization process). The thermal degradation of coir fibers is expected to be complicated due to the presence of the varied constituents. The effects of crystallinity, orientation and cross-linking on the pyrolitic behaviour of cellulosic fibers have been reported [22-24]. The thermal break down of cellulose proceeds essentially through two types of reactions. At lower temperatures (between 120 and 250°C), a gradual degradation due to depolymerization, hydrolysis, oxidation, dehydration and decarboxylation takes place. At higher temperatures, rapid volatilization takes place, accompanied by the formation of levoglucosan and a charred product . Decomposition causes severe initial molecular weight loss that occurs via the rupture of chains at the crystalline-amorphous interface  leading to loss of fiber strength and a marked reduction in degree of polymerization (DP). In this work for the first time we report the significance of transesterification and curing on the thermal behaviour of agro waste coir fibers. This work has got diverse benefits. First, the agro waste fibers are profusely available free of cost and have the distinctive properties of converted to more hydrophobic fiber after modification. Secondly, the technique adopted here is very simple and user-friendly. Transesterification is a method for reducing the hygroscopicity of the natural coir fiber. In this case transesterification is carried out in basic medium using catalyst sodium hydroxide or pyridine. The hydroxyl group of the cell wall of coir fiber reacts with acrylate moiety of butyl acrylate to yield acrylate incorporated fiber having ester linkages, so that fiber becomes more hydrophobic in nature. Further on curing of these transesterified fibers with BPO, phenyl and benzyl groups are introduced in the vinyl part of acrylate moiety of transesterified fibers leading to more hydrophobicity and rigidity due to interlocking. Further the process of transesterification and curing does not pollute the environment and involve no toxic discharge. In this study we report thermal responses of Base Coir, [Coir-ONa (4%)], [Coir-BA (Py/Acetone)], [Coir-BA (Py/Acetone)-C-BPO], [Coir-BA (4% NaOH)], and [Coir-BA (4% NaOH)-C-BPO]. This coir was subjected to TG, DTG, DTA and DSC analyses. The activation energy and the order of reaction has been evaluated with the help of Freeman-Caroll model to investigate the importance of transesterification and curing on their thermal stability which improves the quality of the fibers, and can be used as good reinforcement for designing and fabrication of novel polymeric composites, textiles fiber, good adsorbent, adsorbate, enzyme and other potential applications with high temperature stabilities. Coir fibers were purified by soxhelation with 1:1 benzene-ethanol mixture for 72 hours at 50°C followed by washing with acetone, ethanol in addition to air-drying and was termed as base coir hereafter. Butylacrylate was purified as reported earlier . Other chemicals like acetone, methanol, ethanol, sodium hydroxide, acetic acid, pyridine, benzoyl peroxide etc. were of analytical grade (BDH chemicals) and were used after purification by standard methods. Alkali treatment of coir [Coir-ONa (4%)]: The purified coir (base coir) was treated with alkali (4% NaOH, w/v) solution for 1 h at 35°C with occasional shaking followed by washing with dilute acetic acid and distilled water for a week to leach out the absorbed alkali. The materials were then air-dried and termed as [Coir-ONa (4%)]. Transesterification of base coir with butylacrylate or transesterified base coir CoirBA (Py/acetone)]: Direct transesterification of base coir was done by refluxing the base coir (1 g) with butylacrylate (20 mL) in acetone (20 mL) using pyridine (4 mL) as catalyst at 50°C for 6 h. The transesterified fibers were washed with dilute acetic acid and acetone, followed by methanol and distilled water then air dried. These fibers were then termed as [Coir-BA (Py/Acetone)]. Transesterification of alkali treated coir with butylacrylate or transesterified alkali treated coir [Coir-BA (4% NaOH)]: Transesterification of 4% NaOH treated coir (1 g) was done under reflux with butyl acrylate (20 mL) at 50°C for 6 h. The transesterified fibers were then washed with dilute acetic acid and acetone, followed by methanol and distilled water, then finally air-dried. These fibers were then termed as [Coir-BA (4% NaOH)]. Curing of transesterified coir with benzoyl peroxide: Curing of transesterified base coir (0.4 g) was done under reflux with 10 mL of 0.1 M BPO in acetone (40 mL) at 50°C for 2 h. The reacted fibers were washed with dilute acetic acid and acetone, followed by methanol and distilled water then air dried. These fibers were then termed as [Coir-BA (Py/Acetone)-C-BPO]. Similarly, curing of transesterfied 4% NaOH treated coir (0.4 g) was done under reflux with 10 mL of 0.1 M BPO in acetone (40 mL) at 50°C for 2 h. The reacted fibers were washed with dilute acetic acid and acetone, followed by methanol and distilled water then air dried. These fibers were then termed as [Coir-BA (4% NaOH)-C-BPO]. Thermal characterization of coir fibers: The thermal properties of different fibers were carried out using TG and DSC (Perkin Elmer USA, STA6000). A heating rate of 10°C min-1, and a sample weight of 10 ± 2 mg were used, and experiments were done in a nitrogen atmosphere at a flow rate of 40 mL min-1. Same procedure was adopted for DTA (OKAY, India). The TG and DTG curves for Base coir, Coir-ONa (4%), Coir-BA (Py/Acetone), Coir-BA (Py/Acetone)-C-BPO, Coir-BA (4% NaOH) and Coir-BA (4% NaOH)-C-BPO, are shown in Figure 1 and the properties evaluated from the curves are given in Table 1. Table 1. Results of thermo gravimetric (TG and DTG) analysis of Base and Chemically modified coir fibers. Figure 1: TG and DTG of (a) Base Coir (b) Coir-ONa (4%) (c) Coir-BA (Py/Acetone) (d) Coir- BA (Py/Acetone)-C-BPO (e) Coir-BA (4% NaOH) and (f) Coir-BA (4% NaOH)-C-BPO. Approximately 9.5-12% weight loss was observed between 50 and 150°C (Table 1). This is due to absorbed water . The weight loss in this region was similar in Coir-BA (Py/Acetone), Coir-BA (Py/Acetone)-C-BPO and Coir-BA (4% NaOH), which are less than the base coir, so these modified fibers were more hydrophobic than the base coir. While it was higher in Coir-ONa (4%), this happens due to the removal of hemicellulose, pectin, waxes and fats, fiber become floppy i.e. contain more pore. Therefore, the moisture can easily diffuse in these pores resulting increase in moisture regain. In Coir-ONa (4%), the moisture loss peak was not found to have any considerable change compared to the Base coir, but the weight loss at 100°C was found to be slightly higher in the Base coir. The main degradation peak temperature is shifted to higher temperature for Coir-ONa (4%). About 19°C increases in the degradation peak temperature and higher percentage of residue indicate better thermal stability of Coir-ONa (4%). Alam et al. reported that alkali treatment reduced hemicelluloses in the fiber thereby making the fibre thermally more stable. Lignocellulosic fibers degrade in several steps . The hemicellulose part starts degrading within 240-310°C, whereas the cellulose part starts degrading in the range of 310-360°C, however, the degradation temperature of lignin has a wide range from 200-550°C . Lignin a natural polymer is a three-dimensional, highly cross-linked macromolecule composed of three types of substituted phenols; sinapyl, coniferyl, and p-coumaryl alcohols. It has wide range of degradation temperature from 100 to 800°C due to the presence of stable aromatic rings with multiple branching , which leaves behind some un-volatized char due to the formation of highly condensed aromatic structures. Degradation of lignin proceeds in three stages of different temperature windows. The first stage occurs within 30-120°C due to the removal of the adsorbed water and the second stage which occurs in the temperature window 180-350°C is attributed to the degradation of carbohydrate component of the lignin being converted to CO, CO2, and CH4. Finally, at temperatures greater than 500°C, the process is associated with the decomposition of aromatic rings . This also includes the formation of gaseous products due to the degradation of alcohols, phenolics, aldehydes, acids derived from lignin which starts after 350°C. Temperature of maximum rate of weight loss (Tmax) is obtained from a plot of the rate of weight loss versus temperature. From Figure 1, it is found that degradation occurred in three steps, so the decomposition of lignocellulosic compounds hemicelluloses (Tmax-1 (°C)), cellulose (Tmax-2 (°C)) and lignin (Tmax-3 (°C)), for all the fibers are given in Table 1. In Figure 1, it is noted that the chemical treatment improved thermal stability of the fiber, characterized by an increase in initial temperature of degradation. An increase in the initial degradation temperatures (300, 298 and 310°C) in Coir-BA (Py/ Acetone), Coir-BA (Py/Acetone)-C-BPO and Coir- BA (4% NaOH)-C-BPO respectively, compared with the base coir fibers (290°C) can be seen. Similar results were obtained in the thermal behaviour of tamarind fruit fibers . Temperature for completion of degradation (Tf (°C)), residual weight at Tmax-1 (%), Tmax-2 (%) and Tmax-3 (%), weight loss up to 150°C (%) and the char yield at 550°C (%) were determined from TG/DTG curves (Figure 1) and are given in Table 1. The treatment of coir fibers with 4% NaOH resulted in a considerable increase in Tmax-2 (°C). It is likely that the initial decomposition of coir fibers is initiated by the cementing material. This cementing material composed of different non cellulosic materials like lignin, pectin, hemicellulose, as well as other carbohydrate polymers . On alkali treatment there is a partial loss of such cementing material via the rupture of ester linkages between polyuronic acid and lignin . The observed increase in Tmax-2 (°C) could, therefore be accounted for by the presence of high molecular weight components in the cementing material. Due to these effects Tmax-1 (°C) disappeared completely in coir-ONa (4%). and Coir- BA (4% NaOH) with increase in Tmax-2 (°C) compared to Base coir, but Tmax-1 (°C) is less intense with enhanced Tmax-2 (°C) value in Coir-BA (4% NaOH)-C-BPO in comparison to base coir. Due to loss of cementing material Tmax-3 (°C) decreases in Coir-ONa (4%NaOH), Coir-BA (4% NaOH) and Coir-BA (4% NaOH)-C-BPO in comparisons to the Base coir. The final decomposition temperature (Tf (°C)), obtained by extrapolation of Base coir, Coir-ONa (4%), Coir-BA (Py/Acetone), Coir- BA (Py/Acetone)-C-BPO, Coir-BA (4%NaOH) and Coir-BA (4% NaOH)-C-BPO are found to be 395, 400, 490, 494, 427 and 460°C respectively. Results showed that the degradation temperature of chemically modified fiber was more than base coir. So, the fiber became more thermally stable after chemical modifications. This attributed due to the fact that BA and BPO treatments create orderly arrangement of coir-fiber by transesterification followed by curing in the moiety of –OH and –CH=CH2 groups respectively. It has been observed that Coir-BA (Py/Acetone)-C-BPO and Coir-BA (Py/Acetone) has significant thermal stability than the base coir. Thermal stability of chemically modified fibers follow the order as Coir-BA (Py/Acetone)-C-BPO>Coir-BA (Py/Acetone)>Coir-BA (4% NaOH)-C-BPO>Coir-BA (4% NaOH)>Coir-ONa (4%)>Base coir. The DTA of Base coir, Coir-ONa (4%), Coir-BA (Py/Acetone), Coir-BA (Py/Acetone)-C-BPO, Coir-BA (4%NaOH) and Coir-BA (4% NaOH)-C-BPO are shown in Figure 2 and important peak of the curve with data are given in Table 2. All types of fiber show an endothermic peak within the temperature range 75-82°C due to loss of moisture. Base coir, Coir-BA (Py/Acetone), Coir-BA (Py/Acetone)-C-BPO show exothermic peak at 372, 400, 355°C respectively for the degradation of hemicellulose and thermal depolymerization of the glucosidic linkages of cellulose, but the intensity of these type of peaks are very low in NaOH treated fibers of Coir-ONa (4%), Coir-BA (4%NaOH) and Coir-BA (4% NaOH)-C-BPO due to removal of hemicellulose. A large endothermic peak between 382 and 430°C indicate the degradation of cellulose and lignin. It represents the complete loss of OH groups of monomer unit of cellulose, depolymerization and volatization of cellulose. A large exothermic peak between 438 and 548°C indicate the degradation of lignin. In Coir-BA (Py/Acetone), the endothermic and exothermic peak becomes broader at 430, 547.22°C in comparison to the endothermic and exothermic peak at 420, 462.50°C respectively in base coir, this happens due to the introduction of acrylate moiety after transesterification. In Coir-BA (Py/Acetone)-C-BPO, sharp endothermic and sharp exothermic peak appears at 425 and 475°C respectively due to BPO curing in the acrylate moiety of transesterified fibers. But these types of peaks are not significant in Coir-BA (4%NaOH) and Coir-BA (4% NaOH)-C-BPO due to removal of hemicellulose. These results represent the degradation process of both lignocellulose and acrylate moiety responsible for the degradation of transesterified coir, similarly the degradation process of transesterified coir and BPO responsible for the degradation of BPO cured coir. It is found that the degradation temperature of chemically modified coir was higher in comparison to the base coir. Thus the thermal stability improved in modified coir. Figure 2: DTA of (a) Base Coir (b) Coir-ONa (4%) (c) Coir-BA (Py/Acetone) (d) Coir- BA (Py/Acetone)-C-BPO (e) Coir-BA (4% NaOH) and (f) Coir-BA (4% NaOH)-C-BPO. Table 2. DTA data of Base and Chemically modified Coir Fibers. Differential scanning calorimeter (DSC) analysis was carried out on the Base and chemically modified coir to determine the thermal behavior of fibers. DSC analysis also enables the identification to be made on chemical activity occurring on the fibers as the temperature is increased. DSC analysis curve of Base coir, Coir-ONa (4%), Coir-BA (Py/Acetone), Coir-BA (Py/Acetone)-C-BPO, Coir-BA (4% NaOH) and Coir-BA (4% NaOH)-C-BPO are shown in Figure 3, and important peak of the curve with data are given in Table 3. A sharp endothermic peak observed in the temperature range of 79-98°C in the base and chemically modified coir corresponds to the heat of vaporization of water absorbed in the fibers. In case of modified coir the peak of heat of vaporization of water shifted to higher temperature compared to Base coir. In cellulose fibers lignin starts to degrade at a temperature around 200°C, while the other polysaccharides such as cellulose degrades at a higher temperature . Therefore peaks which are at higher temperature than 200°C indicate the decomposition of cellulose in the fiber. The first exothermic hump in the DSC curve for parent coir, Coir-ONa (4%), Coir-BA (Py/Acetone), Coir-BA (Py/Acetone)-C-BPO, Coir-BA (4% NaOH) and Coir-BA (4% NaOH)-C-BPO is 280, 276.47, 280, 285.29, 270 and 278°C respectively, which is due to the thermal degradation of hemicellulose and the glycosidic linkages of hemicellulose. It is found that the exothermic hump for degradation of hemicellulose are less in the DSC curve of Coir-ONa (4%), Coir-BA (4%NaOH) and Coir-BA (4% NaOH)-C-BPO as shown in Figure 3b, 3e and 3f respectively compared to the base coir, this happens due to removal of hemicellulose from the coir after alkali treatment. Cellulose is more resistant to thermal treatment in comparison to hemicelluloses due to its crystalline structure. When heated cellulose ongoing three primary reactions: oxidation, dehydration and depolymerisation. Thermo oxidation and dehydration taking place mainly in the amorphous phase of polysaccharides. At temperatures above 300°C, depolymerisation becomes the dominant reaction of the degradationof cellulose. The second endothermic peak for parent coir, Coir-ONa (4%), Coir-BA (Py/Acetone), Coir-BA (Py/Acetone)-C-BPO, Coir-BA (4% NaOH) and Coir-BA (4% NaOH)-C-BPO is 333.82, 366.17, 361.76, 361.76, 364.70 and 357.35°C respectively, this is due to the degradation of cellulose leading to char. In this case degradation temperature of cellulose in the modified coir is more than the base coir, which increases the thermal stability of the modified coir. Table 3. DSC data of Base and chemically modified coir Fibers. In the base coir the endothermic peak at 333.82°C caused by the decomposition of α-cellulose. In case of Coir-BA (4% NaOH) and Coir-BA (4% NaOH)-C-BPO, the α-cellulose decomposition peak changed from endothermic to an exothermic peak and shifted to high temperature at 375 and 380°C in Figure 3e and 3f respectively. It is therefore, apparent that the removal of the non-cellulosic constituents such as hemicellulose, pectin etc., during alkali treatment leading to the destruction of the chemical linkages between the constituents might have some influence in inverting the α-cellulose degradation peak from endothermic to exothermic . The endothermic peak at 250°C appears due to the degradation of fatty ester product of waxy layer in all the fibers. Exothermic peak at 360°C in base coir and endothermic peak at 390°C in Coir-BA (4% NaOH)-C-BPO of Figure 3a and 3f respectively, due to degradation of cellulose and formation of char. In addition there is one more step with a exothermic peak at 430°C in Coir-ONa (4%) and Coir-BA (4% NaOH)-C-BPO, in Figure 3b and 3f respectively. In this step, the rest of the char is oxidized and the rest of mass consumed . From the DSC analysis it is found that the thermal stability of modified coir enhanced in comparison to the base coir. Figure 3: DSC of (a) Base Coir (b) Coir-ONa (4%) (c) Coir-BA (Py/Acetone) (d) Coir-BA (Py/Acetone)-C-BPO (e) Coir-BA (4% NaOH) and (f) Coir-BA (4% NaOH)-C-BPO. The activation energy also reveals the degree of thermal stability of the fibers. The larger the activation energy the more thermally stable is the material. The present calculation is based on the equation derived by Freeman-Caroll [36,37]. From the residual weight of the fibers the values of Δ log dw/dt/Δ log w is plotted against Δ (1/T)/Δ logw keeping Δ (1/T) constant at 0.2 x 10-4. The slope of the linear plot is –E/2.303 R. The intercept indicates the order of the pyrolytic reaction. The order of the reaction has been found to be unity in all the base and chemically modified coir fibers. The linear plots are shown in Figure 4 and the estimated values of activation energy of base and modified fibers are given in Table 4. The values of activation energy follow the order as Coir-BA (Py/Acetone)-C-BPO>Coir-BA (Py/Acetone)>Coir-BA (4% NaOH)-C-BPO>Coir-BA (4% NaOH)>Coir-ONa (4%)>Base coir, which is in agreement with TG and DTG analyses. The values of activation energy is maximum for Coir-BA (Py/Acetone)-C-BPO, due to the fact that with such a substrate larger numbers of chain do participate in thermal reaction thereby restricting weight loss. From the values of activation energy it is found that the thermal stability of modified coir is more in comparison to the base coir which was supported by TG, DTG, DTA and DSC. Base coir fiber is an anisotropic material, and the amount of its principal component, as well as inorganic components varies with geographical locations, types of species, and complexity of growth; these variables directly affect the degradation process as well as the activation energy. Despite these factors, the modified fibres showed increased thermal properties in comparison to base coir fiber. 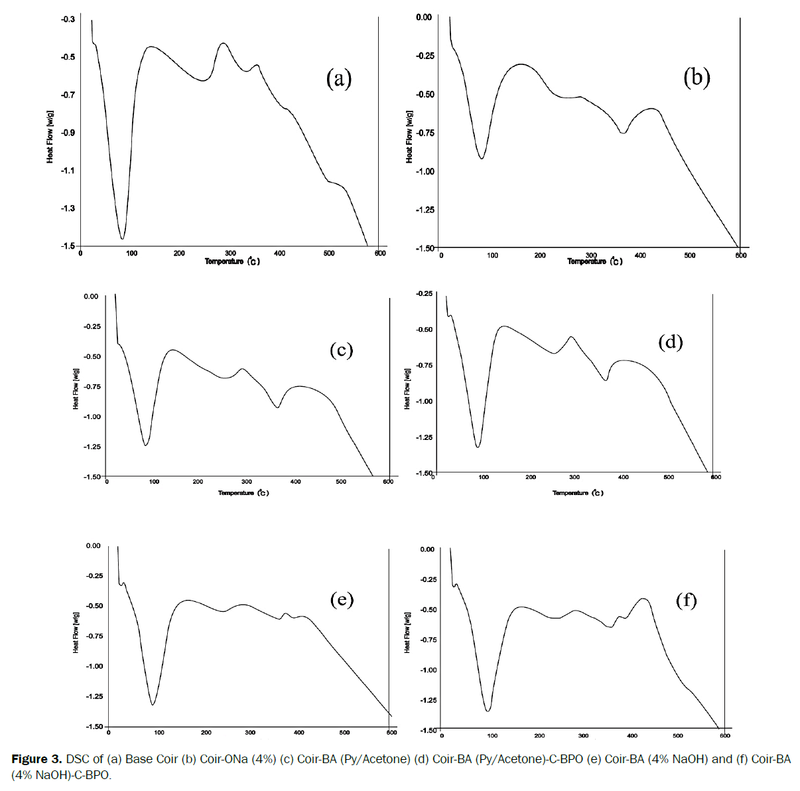 Figure 4: Plots for determination of Kinetic energy using Freeman and Caroll equation for Pyrolysis of (a) Base Coir (b) Coir-ONa (4%) (c) Coir-BA (Py/Acetone) (d) Coir- BA (Py/Acetone)-C-BPO (e) Coir-BA (4% NaOH) and (f) Coir-BA (4% NaOH)-C-BPO. Table 4. Activation Energy (Ea) of Base and chemically modified coir Fibers calculated by Freeman and Caroll Method. The potential use of coir fibers as reinforcing agents is based on the interfacial properties between coir fiber and the polymer matrix. Poor resistance of the coir fibers to water absorption can have adverse effects on the structure, dimensional and mechanical properties of the coir fiber reinforced composites. However, it is possible to increase the thermal stability by reducing the moisture absorption property of coir fiber through its surface modification. The results presented in this work indicate that the transesterified and cured transesterified coir fibers are thermally more stable and hydrophobic than the base coir fiber. Modification of coir fiber by treatments with BA and BPO resulted in a reduction in weight loss below 150°C, which indicates that, such treatment makes the coir hydrophobic. The TG and DTG curves show decomposition peaks over three stages due to hemicellulose (290-310°C), cellulose (330-347°C) and lignin (200-484°C) respectively. Thermal stability of chemically modified fibers follow the order as Coir-BA (Py/Acetone)-C-BPO>Coir-BA (Py/Acetone)>Coir-BA (4% NaOH)-C-BPO>Coir-BA (4% NaOH)>Coir-ONa (4%)>Base coir. It was established that significant increase in thermal stability may be imparted to coir through a simple chemical route involving transesterification and/or curing with the use of cheap chemical reagents. It was observed that transesterification and curing improve the thermal stability of the fibers, making them highly suitable for their applications as good reinforcement materials for designing and fabrication of novel polymeric composites, textiles fibers, adsorbents and adsorbates. Joseph K, et al. Effect of chemical treatment on the tensile properties of short sisal fibre-reinforced polyethylene composites. Polym 1996;37:5139-5149. Nayak SK, et al. Influence of short bamboo/glass fiber on the thermal, dynamic mechanical and rheological properties of polypropylene hybrid composites. Mater Sci Eng: A 2009;523:32-38. Kalia S, et al. Pretreatments of natural fibers and their application as reinforcing material in polymer composites-A review. Polym Eng Sci 2009;49:1253-1272. Samal RK, et al. Effect of chemical modification on FTIR spectra. I. Physical and chemical behavior of coir. J Appl Polym Sci 1995;58:745-752. Silva GC, et al. Mechanical and thermal characterization of native Brazilian coir fiber. J Appl Polym Sci 2000;76:1197-1206. Dey G, et al. 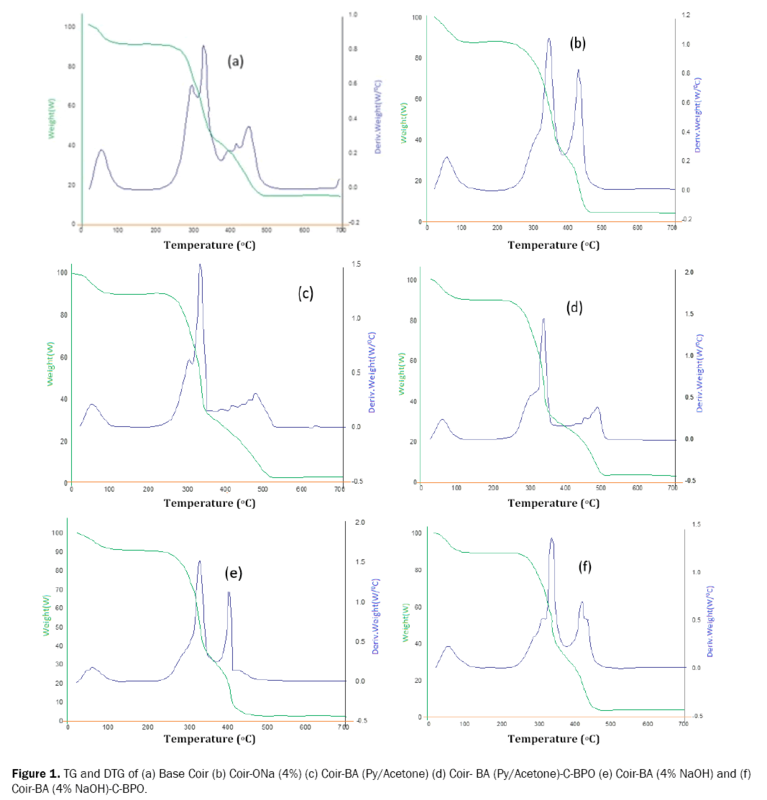 Profiling C6–C3 and C6–C1 phenolic metabolites in Cocos nucifera. J Plant Physio 2005;162:375-381. Tomczak F, et al. Studies on lignocellulosic fibers of Brazil. Part II – Morphology and properties of Brazilian coconut fibers. Compos A 2007;38:1710-1721. Satyanarayana KG, et al. Studies on lignocellulosic fibers of Brazil. Part I – Source, production, morphology, properties and applications. Compos A 2007;38:1694-1709. Carrijo OA, et al. Fibra da casca de coco verdecomosubstratoagrícola. Horticultura Brasileira 2002;20:533-535. Coelho MAZ, et al. Aproveitamento de resíduosagroindustriais: Produçao de enzimas a partir da casca de coco verde. Boletim CEPPA 2001;19:33-42. Brígida AIS and Rosa MF. Determinacao do teor de taninosnacasca de coco verde (Cocos nucifera L.). Proceedings of the Inter american Society For Tropical Horticulture 2003;47:25-27. Dey G, et al. Immobilization of a-amylase from Bacillus circulans GRS 313 on coconut fiber. Appl Biochem Biotech 2002;102:303-313. Brígida AIS, et al. Immobilization of Candida antarctica lipase B by covalent attachment to green coconut fiber. Appl Biochem Biotech 2007;136:67-80. Brígida AIS, et al. Immobilization of Candida antarctica lipase B by adsorption to green coconut fiber. Appl Biochem Biotech 2008;146:173-187. Rout J, et al. Scanning electron microscopy study of chemically modified coir fibers. J Appl Polym Sci 2001;79:1169-1177. Rosa MF, et al. Effect of fiber treatments on tensile and thermal properties of starch/ethylene vinyl alcohol copolymers/coir biocomposites. Bioresource Technol 2009;100:5196-5202. Varma DS, et al. Thermal behaviour of coir fibres. Thermochem Acta 1986;108:199-210. Rosa MF, et al. Cellulose nanowhiskers from coconut husk fibers: effect of preparation conditions on their thermal and morphological behaviour. Carbohydr Polym 2010;81:83-92. Varma DS, et al. Coir fibers: part I: effect of physical and chemical treatments on properties. Text Res J 1984;54:827-832. Jayavani S, et al. Recent development and future trends in coir fiber reinforced green polymer composites: review and evaluation. Polym Compos (2015) Published online: 18 May 2015 in Wiley Online Library (wileyonlinelibrary.com) © 2015 Society of Plastics Engineers. Samal RK, et al. Effect of Chemical Modification on FTIR Spectra; Physical and Chemical Behavior of Coir-II. J Polym Mater 1995;12:229-234. Basch A and Lewin M. The influence of fine structure on the pyrolysis of cellulose. I. Vacuum pyrolysis. J Polym Sci Polym Chem Ed 1973;11:3071-3093. Basch A and Lewin M. The influence of fine structure on the pyrolysis of cellulose. II. Pyrolysis in air. J Polym Sci Polym Chem Ed 1973;11:3095-3101. Basch A and Lewin M. Influence of fine structure on the pyrolysis of cellulose. III. The influence of orientation. J Polym Sci Polym Chem Ed 1974;12:2053-2063. Broido A, et al. Molecular weight decrease in the early pyrolysis of crystalline and amorphous cellulose. J Appl Polym Sci 1973;17:3627-3635. Samal RK, et al. Vinyl-ester-participated Transesterification and Curing on the Physicochemical Behaviour of Coir–IV. J Appl Polym Sci 1997;64:2283-2291. Alam MS, et al. Effect of Chemical Treatment on the Physical, Thermal and Mechanical Properties of Coir Fibre. J Appl Sci Technol 2010;7:17-22. Yang H, et al. Characteristics of hemicellulose, cellulose and lignin pyrolysis. Fuel 2007;86:1781-1788. Barreto ACH, et al. Properties of sisal fibers treated by alkali solution and their application into cardanol-based biocomposites. Compos A. Appl Sci Manuf 2011;42:492-500. Tejado A, et al. Physico-chemical characterization of lignins from different sources for use in phenol–formaldehyde resin synthesis. Bioresour Technol 2007;98:1655-1663. Maheswari CU, et al. Tensile Properties and Thermal Degradation Parameters of Tamarind Fruit Fibers. J Reinf Plast Compos 2008;27:1827-1832. Knauf M and Moniruzzaman M. Lignocellulosic biomass Processing: a perspective. Int Sugar J 2004;106:147-150. Aziz SH and Ansell MP. The effect of alkalization and fibre alignment on the mechanical and thermal properties of kenaf and hemp bastfibre composites: Part1 – polyester resin matrix. Compos Sci Technol 2004;64:1219-1230. Ray D, et al. Effect of alkali treated jute fibres on composite properties. Bull Mater Sci 2001;24:129-135. Paunikallio T, et al. Composition, tensile properties, and dispersion of polypropylene composites reinforced with viscose fibers. J Appl Polym Sci 2004;91:2676-2684. Freeman ES and Carroll B. The Application of Thermoanalytical Techniques to Reaction Kinetics: The Thermogravimetric Evaluation of the Kinetics of the Decomposition of Calcium Oxalate Monohydrate. J Phys Chem 1958;62:394-397. Anderson DA and Freeman ES. The kinetics of the thermal degradation of polystyrene and polyethylene. J Polym Sci 1961;54:253-260.